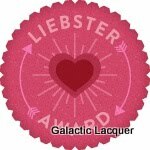 Galactic Lacquer: My first blogger awards! 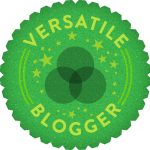 I also was nominated by Polished Paradise for the Versatile Blogger Award! I have never had a professional manicure! I'm the only one who has ever filed or painted my nails! I'm a digital media major at UCF and I love art and web design. I'm a huge nerd who is into things like Monty Python and the Holy Grail, Star Wars, and The Hitchhiker's Guide to the Galaxy. I love cats! I currently have two, named Zelda and Midna. My favorite ice cream is cookies n' cream. Thank you! It has been going well so far for only being up a few days! Not even a week :) I have so much in store for it, so I hope it keeps going swimmingly!